Enamel pearls are anomalies of enamel found ectopically from the crown. They have been reported since 1842 with several names with an origin that is still unclear. They are frequently located in maxillary molars, but it is possible to find them in different places and in different sizes to those previously reported. Types of enamel pearls have been described along with a variable prevalence and symptomatology with implications in clinic that must be taken into consideration. The proper analysis of routine exams in dental practice such as panoramic digital radiographs is useful for the detection of enamel pearls, even those asymptomatic. Their exact location could be also addressed using three dimension imagining technology when necessary according to the case. Although they can be a risk factor to develop endodontic and periodontal unfavourable conditions in the affected teeth, their presence is not always associated to develop this conditions and can be found in different quantity, shapes, places and teeth to those previously reported as is shown in this case. Enamel pearls are anomalies of enamel usually found in the root. Has been mentioned that they were first described by Linderer in 1842  and have been named enamlomas, enamel globules or enamel droplets, among others [2,3]. Its origin is still unclear, but one of the most accepted theories about its etiology remains in that they develop as a result of a developmental localized activity of a Hertwig epithelial root sheath remnant which is adherent to the root surface during the root development. These cells then differentiate into functioning ameloblasts producing enamel organic matrix deposits on the root [4-6]. In the literature have been described three types of enamel pearls: true enamel pearls, which are composed by enamel only; composite enamel pearls, which contain a core of tubular dentine; and enamel dentin pulp pearls, which contain a pulp horn that may be an extension from the pulp chamber or root canal . Their size and location is variable. They vary in size from 0.3 mm to 4 mm in diameter  or even lower or greater to those measurements reaching 1.8 mm wide and 8 mm long . Their location is usually associated to molars in maxillary arcus more than in other teeth or places [8,9] especially in the furcation area of second and third maxillary molars . They are usually adherent to the root surface, but they can also be found within the dentine of a tooth . It is possible to detect them with radiographic exams, where they are dense, and as smooth radiopacities overlying a portion in the root or crown. They are difficult to identify in temporal dentition due to the superimposition of the developing permanent teeth . The prevalence of enamel pearls is still variable. It ranges from 1.1% to 9.7% [8,12-14]. In 2014, Colak et al. stated a prevalence of 2% . These structures contribute to the development of periodontal or endodontic diseases, because affects the mechanical control of dental biofilm, creating niches . They can also contribute to local deepening of periodontal pockets due to a not proper attachment of the periodontal ligament . Female patient, 27 years old, with no systemic pathologies, attended to private practice for rehabilitation of teeth 3.7 and 4.7 with extended crown destruction. Presence of generalized gingivitis and multiple dental caries was observed. Panoramic radiographic was requested as part of routine dental exams before treatment. Enamel pearls were found in teeth 1.6, 2.6, 3.8 and 4.7 (Figure 1). Patient was asked later for family history of enamel pearls and no antecedents were found. Tooth 1.6 presented an enamel pearl in one of its roots (Figure 2), tooth 2.6 presented enamel pearls in two of its roots (Figure 3), and teeth 3.8 and 4.7 presented an enamel pearl in the interradicular space (Figures 4 and 5). Distribution is presented in Table 1. Table 1: Distribution of enamel pearls. Figure 1: Panoramic radiography. Four teeth with enamel pearls in the root area are observed. Figure 2: Tooth 1.6 with an enamel pearl in distal of one of its roots. Figure 3: Tooth 2.6 with enamel pearls in the root area, located mesially and distally. 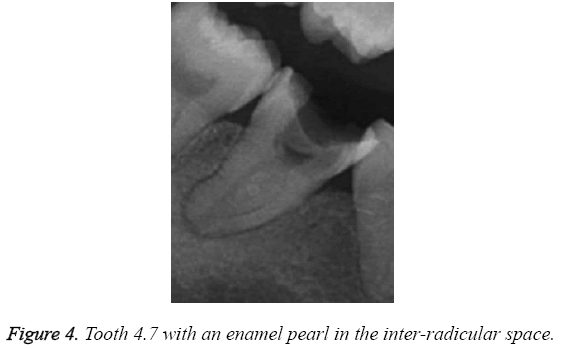 Figure 4: Tooth 4.7 with an enamel pearl in the inter-radicular space. 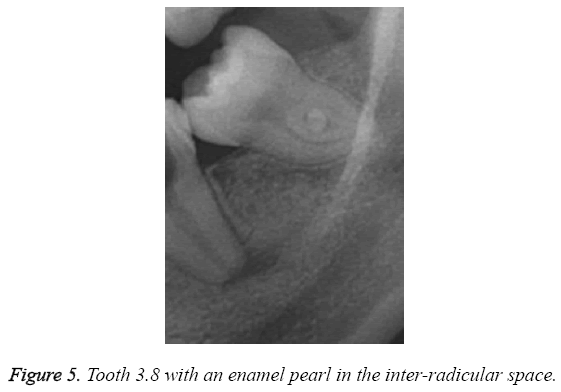 Figure 5: Tooth 3.8 with an enamel pearl in the inter-radicular space. Has been described that enamel pearls affect more frequently to maxillary molars than mandibular molars [8,9], in this case, maxillary and mandibular molars where equally affected. They are usually solitary lesion, but more than one have been observed in the same tooth, have in tooth 2.6 where two enamel pearls were observed. Since 1970, has been reported that this anomalies can be well detected through the analysis of radiographic techniques . Cone Beam Computed Tomography (CBCT) may be useful as well to evaluate presence of tubular dentin within enamel pearls when the affected teeth need to be treated . Although CBCT could allow a more detailed analysis of the enamel pearls, in this case its indication would not be appropriate because enamel pearls had not symptomatology and did not represent an influential factor for the effected teeth function or rehabilitation. Radiographically they appear as well defined nodules, with radiopaque density comparable to the enamel of the crown along the root surface [1,12,17]. Enamel pearls are reported to be commonly at cemetoenamel junction or in the furca of multi rooted teeth , buccal or lingual in mandibular teeth and mesial or distal in maxillary teeth . In this report, enamel pearls of two mandibular molars (3.8 and 4.7) are present in the furca and enamel pearls in maxillary molars are found below the cementoenamel junction. It is accepted to find them adherent to the root surface as those present in this report; nevertheless, they have been detected within the dentin . This anatomical structure can be associated to retention of plaque with clinical implications in periodontium [18,19]. When a composite enamel pearl or enamel dentin pulp pearl is diagnosed it may have implications for endodontic treatment. Enamel pearls are supposed to be derived from a Hertwig epithelial root sheath remnant with a prevalence that is variable. They can be associated to several pathologies especially to periodontal affections in the teeth where they are. In some cases, their presence is not detected due to not symptomatology and to the absence of clinical symptoms. Panoramic digital radiographs seems to be useful for the detection of asymptomatic enamel pearls stated as a and a reliable exam that helps to confirm its presence in case of suspect as well. It is a routine exam that is relevant to obtain a general view and in this case also permitted to identify multiple enamel pearls. Kupietzky A, Rozenfarb N. Enamel pearls in the primary dentition: report of two cases. ASDC J Dent Child 1993; 60: 63-66. Moskow BS, Canut PM. Studies on root enamel (2). Enamel pearls. A review of their morphology, localization, nomenclature, occurrence, classification, histogenesis and incidence. J ClinPeriodontol 1990; 17: 275-281. Romeo U, Palaia G, Botti R, Nardi A, Del Vecchio A, Tenore G, Polimeni A. Enamel pearls as a predisposing factor to localized periodontitis. Quintessence Int 2011; 42: 69-71. Cavanha AO. Enamel pearls. Oral Surg Oral Med Oral Pathol 1965; 19:373-382. Risnes S, Segura JJ, Casado A, Jimenz-Rubio A. Enamel pearls and cervical enamel projections on 2 maxillary molars with localized periodontal disease: case report and histologic study. Oral Surg Oral Med Oral Pathol Oral RadiolEndod 2000; 89: 493-497. Mao XQ. 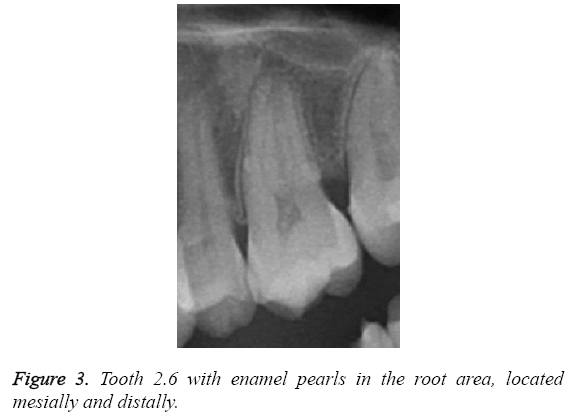 Root-like enamel pearl: a case report. J Med Case Rep 2014: 8:248. Versiani MA, Cristescu RC, Saquy PC, Pécora JD, de Sousa-Neto MD. Enamel pearls in permanent dentition: case report and micro-CT evaluation. DentomaxillofacRadiol 2013; 42: 20120332. Chrcanovic BR, Abreu MHNG, Cust´odio. Prevalence of enamel pearls in teeth froma human teeth bank. J Oral Sci 2010; 52: 257-260. Andrews NH. Periodontal significance of cervical enamel projections. J Canadian Dental Assoc 1975; 41: 50-52. Shojaeian S, Ghoddusi J, Hajian S. A case report of maxillary second molar with two palatal root canals and a furcal enamel pearl. Iran Endod J 2013; 8: 37-39. Sehic A, Nirvani M, Risnes S. Incremental lines in mouse molar enamel. Arch Oral Biol 2013; 58: 1443-1449. Darwazeh A, Hamasha AA. 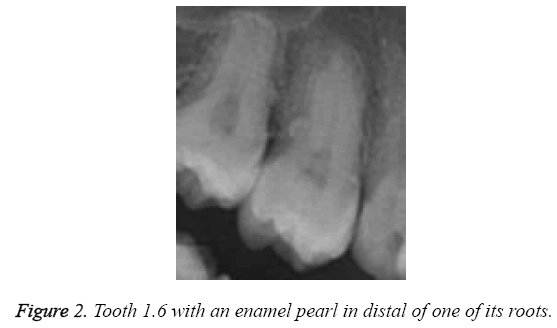 Radiographic evidence of enamel pearls in Jordanian dental patients. Oral Surg Oral Med Oral Pathol Oral RadiolEndod 2000; 89: 255-258. Risnes S. The prevalence and distribution of cervical enamel projections reaching into the bifurcation on human molars. Scand J Dent Res 1974; 82: 413-419. Akgul N, Caglayan F, Durna N, Sumbullu MA, Akgul HM, Durna D. Evaluation of enamel pearls by cone-beam computed tomography (CBCT). Med Oral Patol Oral Cir Bucal 2012; 17: e218-222. Çolak H, Hamidi MM, Uzgur R, Ercan E, Turkal M. Radiographic evaluation of the prevalence of enamel pearls in a sample adult dental population. Eur Rev Med PharmacolSci 2014;18: 440-444. Swan RH, Hurt WC. Cervical enamel projections as an etiologic factor in furcation involvement. J Am Dental Assoc 1976; 93: 342-345. Saini T, Ogunleye A, Levering N, Norton NS, Edwards P. Multiple enamel pearls in two siblings detected by volumetric computed tomography. DentomaxillofacRadiol 2008; 37: 240-244. Tabari ZA, Kadkhodazadeh M, Khademi M. Enamel pearl as a predisposing factor to localized severe attachment loss: a case report. Res J Med Sci. 2011; 5: 141-144. Wu li. A case report of right maxillary third molar with multiple enamel pearls. J PractStomatol 2013; 29: 510.